Poyekhali! Despite the tensions during the Cold War, NASA Administrator Jim Webb congratulated the Soviets on American television. Cold War or not, it’s not every day you accomplishing man’s first orbit. April also brings space fans three major household names: Columbia, Apollo 13 and Hubble. Here are four major space dates for April, including one breakthrough that has roots dating back to 1609, when an Italian scientist invented a new optical device to view the heavens above. Vostok 1 launched into space carrying Soviet Cosmonaut Yuri Gagarin. Vostok 1 orbited the Earth in 108 minutes, marking man’s first space flight and first orbit. At the moment of launch, Yuri Gagarin’s radio communication with the launch control room was “Poyekhali!” which translates to “Let’s go!” The phrase came to refer to the beginning of the Space Age in the Eastern Bloc. In his post-flight report, he recalled the feeling of weightlessness in space. Shuttle Columbia launched on April 12, 1981, orbited Earth 36 times and landed two days later on April 14 on the dry lakebed runway at Edwards Air Force Base in California. Shuttle Columbia became the first winged spaceship to orbit Earth and return to airport landing. It was the first of the four original fully operational orbitals (reusable manned spacecraft). An explosion caused the loss of both oxygen tanks and disrupted the supply of oxygen, electricity, light, and water. Over the next four days, the world held its breath as it watched three astronauts overcome loss of power, cabin heat, and a shortage of water. The crew used the Lunar Module as a lifeboat on it’s return trip to Earth. The historic “successful failure” concluded when Astronauts James Lovell, John Swigert and Fred Haise splashed down in the Pacific Ocean. 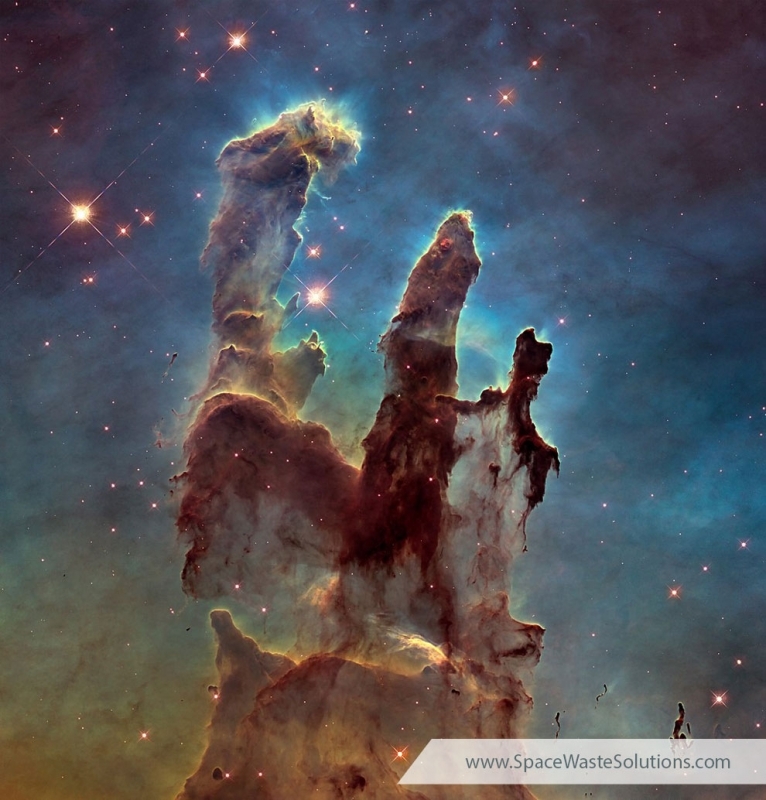 The Hubble Space Telescope became the first observatory to be placed in space after launching in 1990. It marked the biggest advancement in astronomy since the 1600s when Galileo invented the telescope. Since its launch, the Hubble Space Telescope has produced hundreds of pictures of stars and galaxies far, far away. 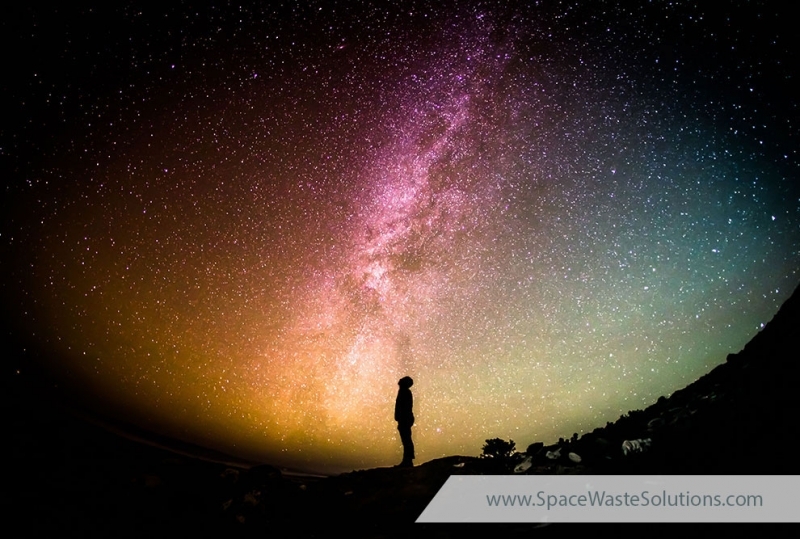 Visit SpaceWasteSolutions.com to find out what has been left in orbit since the beginning of the Space Age. It takes dreamers to push the limits of what we believe to be possible, especially in the realm of space travel. Visionaries and theorists like Robert H. Goddard and risk-takers like Cosmonaut Aleksei Leonov paved the way for the International Space Station and hundreds of space missions, rockets and satellites. Save these dates to remember and celebrate visionaries and space milestones this March. After their 340 days in space mission, the longest recorded time in space for International Space Station crew members, Astronaut Scott Kelly and Cosmonaut Mikhail Kornienko returned to Earth. The One-Year Mission launched on March 27, 2015 and studied the health effects of long-term spaceflight. The information gathered on this mission will be used for future exploration including plans for missions around the Moon, asteroids and Mars. 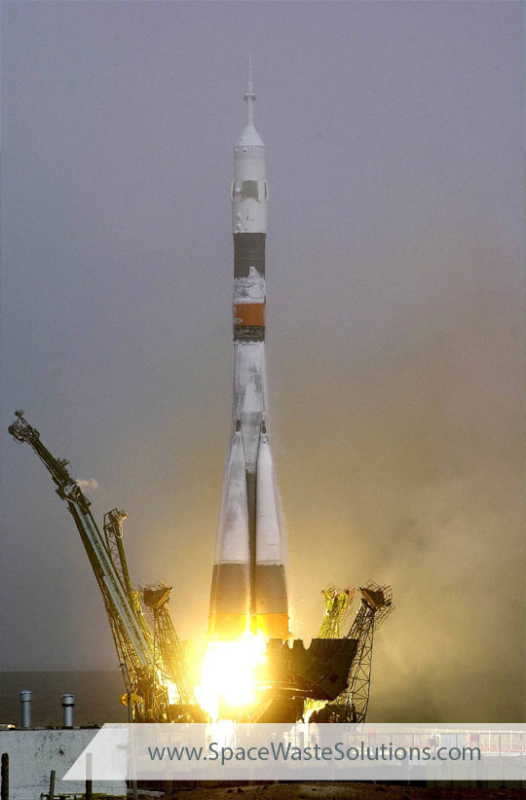 A Soyuz spacecraft, launched from the very spot where Sputnik was launched nearly 40 years early, carried Dr. Norman Thagard, Vladimir N. Dezhurov and Gennady M. Strekalov. Dr. Norman Thagard was the first American to be launched on a Russian rocket, a historic moment many thought would never be possible. Two days later, he became the first American to visit the Russian space station Mir. In Auburn, Massachusetts, Robert H. Goddard, Usherer of the Space Age, launched the first liquid-fueled rocket. The flight lasted 2.5 seconds, propelling the rocket a mere 41 feet in the air. At the time, he was ridiculed for his theories of space flight. Yeas later, the launch site is now a National Historic Landmark. Robert H. Goddard was the first to scientifically study, design and construct the rockets necessary for space travel, atmospheric research and ballistic missiles. Though he did not live to see the first man-made object cross the Kármán line, Robert H. Goddard is recognized as one of the founding fathers of modern rocketry. Cosmonaut Aleksei Leonov spent 12 minutes outside the spacecraft Voskhod 2 to take man’s first space walk. For his extravehicular activity, Aleksei Leonov had no tools to control his motion other than pulling on his 50 foot tether. His space suit expanded from its internal pressure against the vacuum of space and became so rigid he could not activate the shutter on his camera. It wasn’t until nearly four years later that the Soviets attempted another EVA. 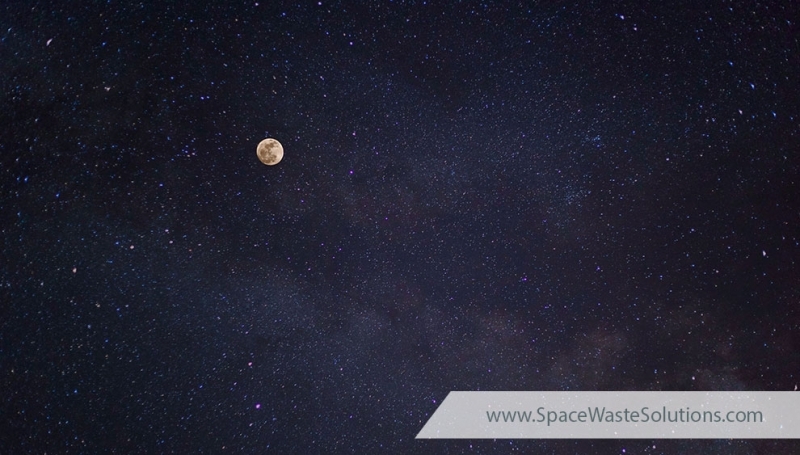 Find out what we have left behind in space at SpaceWasteSolutions.com. “I am a stranger. I come in peace. Take me to your leader and there will be a massive reward for you in eternity.” John Glenn carried these words, written in seven different languages, on his historic mission to space. His mission renewed U.S. confidence in the midst of troubling times. Over forty years later, after competition had evolved into cooperation, confidence in space travel would suffer a tragic setback with the loss of the Space Shuttle Columbia and its seven crew members. From fruit flies to the Space Shuttle Columbia, February is filled iconic moments in space travel. Here are four of those dates worth remembering this February. The world witnessed the second fatal accident in the Space Shuttle program when the Space Shuttle Columbia broke apart over Texas. The disaster occurred just 16 minutes before the space shuttle was scheduled to land in Florida. The crew, Commander Rick D. Husband, Pilot William C. McCool, Payload Commander Michael P. Anderson, Payload Specialist Ilan Ramon, Mission Specialist Kalpana Chawla, Mission Specialist David M. Brown and Mission Specialist Laurel Blair Salton Clark, were killed when the Space Shuttle disintegrated upon reentering Earth’s atmosphere. Operations were suspended for over two years, delaying the construction of the International Space Station. With the exception of one final mission to repair the Hubble Space Telescope, all remaining shuttle missions were flown exclusively to the International Space Station. Astronaut Bruce McCandless II performed man’s first untethered spacewalk off the Challenger space shuttle with a Manned Maneuvering Unit (MMU). The MMU allowed the astronauts to perform untethered Extravehicular activity. The device was use on three Space Shuttle missions before being replaced by the Simplified Aid For EVA Rescue (SAFER). Everyone loves a great space chimp story, but the lesser known heroes are the fruit flies that were launched into space aboard the V-2 rocket. The ascent lasted just 3 minutes and 10 seconds reaching 68 miles, exceeding the international definitions of the boundary of space. The fruit flies survived the trip and provided insight into the effects of radiation exposure at high altitudes. 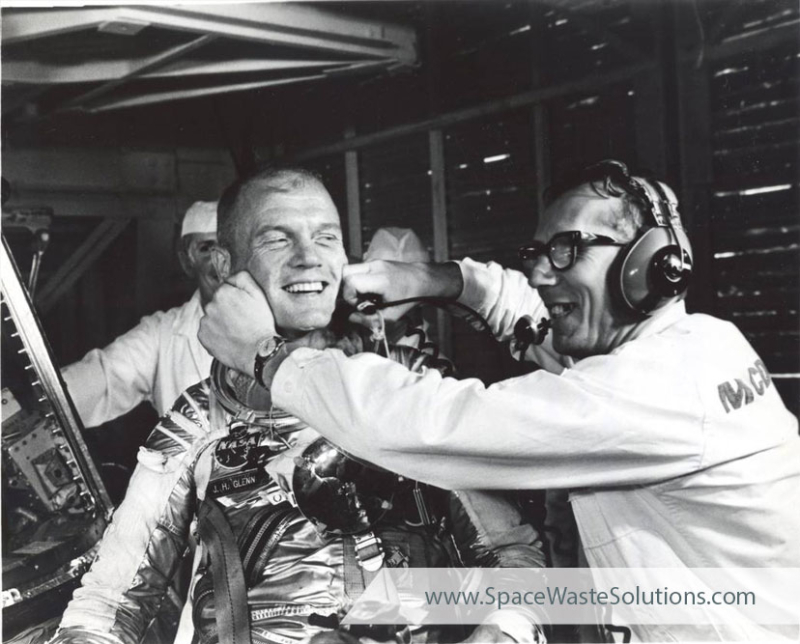 After serving as the backup pilot for the first two manned Project Mercury flights, John Glenn was selected for NASA’s first manned orbital flight. John Glenn, one of the Mercury Seven, completed three orbits around Earth aboard the Friendship 7, becoming the first American to orbit Earth. After a 4 hour and 55 minute flight reaching a maximum altitude of about 162 miles, Friendship 7 safely splashed down 800 miles off the coast of Cape Canaveral. On February 23, 1962, President Kennedy awarded John Glenn the NASA Distinguished Service Medal. 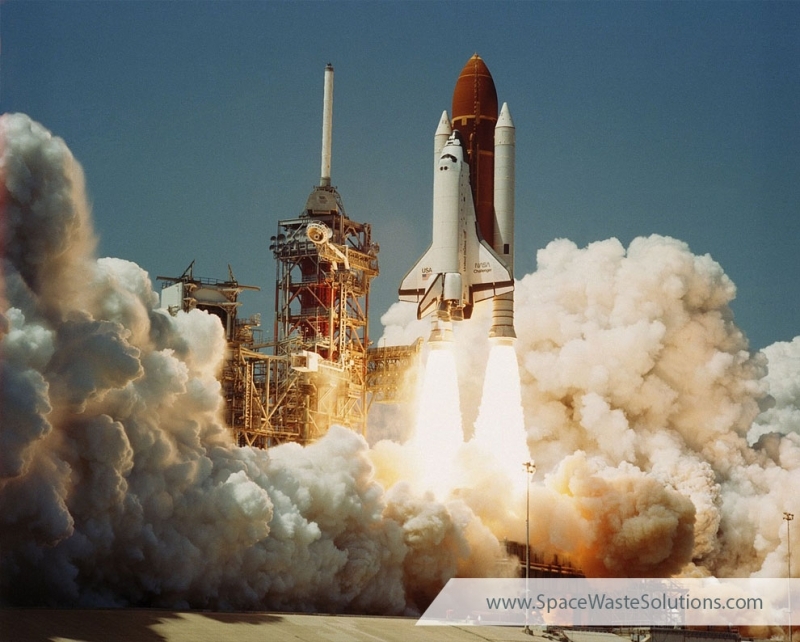 Check back at SpaceWasteSolutions.com to find out what is being done about the problem of space waste. Buckle up, space fans. January has historically been a roller coaster of success and heartache. Over the years, the month of January has seen ground breaking progress in space exploration. Unfortunately, two of the greatest tragedies of space travel also occurred during this month. Commemorate these space dates and remember the heroes who lost their lives in the name of science and exploration. Luna 1, also known as Mechta, became the first artificial satellite to reach the Moon vicinity and first artificial satellite in heliocentric orbit. Launched as part of the Soviet Luna program, Luna 1 missed the Moon due to an incorrectly timed upper stage burn during its launch. As a result, it became the first spacecraft to leave geocentric orbit. In one of the most tragic incidents in space exploration, a flash fire swept through the Apollo I command module, engulfing it in flames during a ground test at Kennedy Space Center. Astronauts Gus Grissom, Edward White and Roger Chaffee were killed in the launchpad fire. They were the first U.S. astronauts to die in a spacecraft. The world watched as the Space Shuttle Challenger exploded just 73 seconds after its launch from Cape Canaveral. Commander Francis R. Scobee, Pilot Michael J. Smith, Mission Specialist Ronald McNair, Mission Specialist Ellison Onizuka, Mission Specialist Judith Resnik, Payload Specialist Gregory Jarvis and Teacher and Payload Specialist Christa McAuliffe were all killed in the explosion. This was the tenth flight of Space Shuttle Challenger. The Rogers Commission, a special commission appointed by President Ronald Reagan to investigate the accident, found NASA’s organizational culture and decision-making processes had been key contributing factors. Ham, a chimpanzee, became the first Hominidae to be launched into space. Ham, an acronym for Holloman Aerospace Medical Center, began his training in July 1959. Ham’s flight was only 16 minutes and 39 seconds long but his performance in space was only a fraction of a second slower than on Earth, demonstrating that tasks could be performed in space. 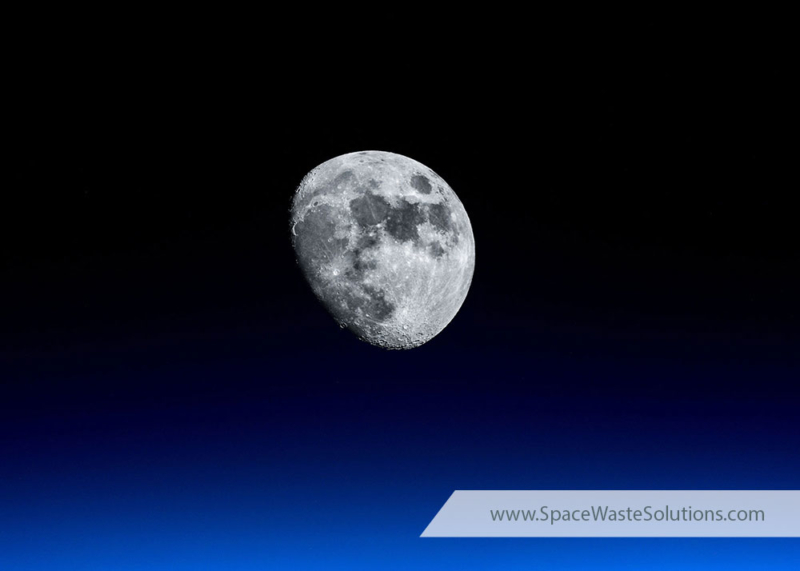 Visit SpaceWasteSolutions.com for updates and information on the growing space waste problem. From man’s first Earthrise to his final steps on the moon, December brings monumental moments in space history. The unmanned space probe, Mars 3, launched on May 28, 1971, just nine days after its twin spacecraft, Mars 2. The identical robotic spacecraft both headed to Mars. On December 2, Mars 3 achieved the first soft Mars landing and, soon after, sent the first signals from Mars. The Mars 3 lander carried a small (under 10 pounds) rover, which was intended to move across the planets surface while tethered to the lander. Unfortunately, the Mars 3 failed shortly after landing and the rover was not deployed. Mars 3, part of the Soviet Mars program, was an unmanned space probe. 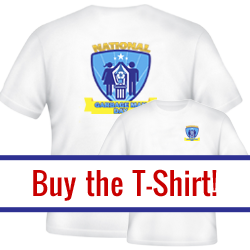 The program spanned 13 years from 1960 to 1973. Apollo 17, the final Apollo mission, marks the last time man visited the moon. The Saturn V rocket launched on December 7, 1972, carrying Commander Eugene “Gene” Cernan, Command Module Pilot Ronald Evans and Lunar Module Pilot Harrison Schmitt. After 74 hours and 59 minutes, Eugene Cernan and Harrison Schmitt left the Moon. Since then, no one has set foot on the surface of the moon. Apollo 17 set multiple records including the longest moon landing, longest total moonwalks, largest lunar sample and longest time in lunar orbit. Lauched on December 21, 1968, Apollo 8 was second manned spaceflight mission in the United States Apollo space program and the first to obit the Earth and return safely. Aboard the Apollo 8, Commander Frank Borman, Command Module Pilot James Lovell and Lunar Module Pilot William Anders came within 70 miles of the lunar surface. On their fourth pass, the crew witness Earthrise for the first time in human history. Apollo 8 returned to Earth on December 27, 1968 and was recovered by the USS Yorktown in the North Pacific Ocean. What about the Space Waste? Find out what happens to materials left in space. Since the launch of Zarya on November 20, 1998, five space agencies, Russia(FKA) USA (NASA) Europe (ESA) Japan (JAXA) Canada (CSA), have worked together to build the orbiting science lab. From a helium-filled high altitude balloon all the way to the International Space Station, November brings back memories of some great achievements in space history. After launching on October 31, 2000 aboard a Soyuz space craft, an American and Russian crew arrived at the International Space Station. Commander William M. “Bill” Shepherd (NASA) and cosmonauts Sergei Krikalev and Yuri Gidzenko of Roscosmos began living aboard the ISS, the the longest running manned space station ever. The Explorer II, a high altitude balloon, launched from a canyon in the Black Hills of South Dakota on November 11, 1935 taking a two-man crew to an altitude of 72,395 ft (22,066 meters). The crew, U. S. Army Air Corps Captains Albert W. Stevens and Orvil A. Anderson, rode inside a sealed, spherical cabin, collecting information about the stratosphere. They also observe and photographed the curvature of the Earth. Explorer II touched down safely on the same day at 4:13 pm. Albert William Stevens and Orvil Arson Anderson were acclaimed as national heroes. Lunokhod 1 launched on November 10, 1970. After traveling for a week, the spacecraft successfully landed on the Moon in the Sea of Rains on November 17, making it the first lunar rover. Lunokhod 1 was the first remote-controlled robot to move freely across the surface of an astronomical object beyond the Earth. The last communication session with Lunokhod 1 ended on September 14, 1971. Its final location was unknown until March 17, 2010, when Albert Abdrakhimov found both the lander and the rover. Zarya, the first module of International Space Station, launched from Baikonur Cosmodrome Site 81 in Kazakhstan on November 20, 1998. Zarya, a Functional Cargo Block, was originally used to provide electricity, storage, propulsion and guidance during the early stages of construction. On December 6, 1998, the U.S.-built Unity node was attached to the Russian-built Zarya module by the crew of space shuttle mission STS-88. Today, Zarya is used mostly for storage. The International Space Station is considered to be one of the most complex scientific and technological endeavors ever undertaken. It is also the largest man-made object built in space. What happens when the ISS is no longer in service? At 239 feet long, 356 feet wide and 66 feet high, the International Space Station weighs just under one million pounds. What do you do with one million pounds of space waste? Why Space Debris appears to be a problem. On October 4th, 1957 the then Soviet Union (USSR) successfully launched its Sputnik 1 satellite into the Earth’s orbit. While the spherical Soviet satellite wasn’t threatening to look at (weighing a mere 184 pounds and measuring a slim 23 inches wide), its small beeping signal heard back on Earth resonated throughout the United States and was viewed as a massive threat. As it turns out, that tiny beep ignited the already simmering space race and effectively forced both countries to push their limits of innovation and technical ability to the breaking point in an effort to reach a nonexistent finish line. October 4th, 1957 was also the day that many stargazers tracked a faintly shining object as it sped around the Earth at 17,500 miles per hour. Many thought that they were looking at Sputnik 1 but in reality, they were seeing the detached rocket body that propelled it into orbit. While Sputnik 1 was roughly the size of a large beach ball, its rocket body was nearly 85 feet long and covered in reflective panels. Because of its size and reflective exterior, the rocket body was what people could actually see from Earth. So why is the launch of the Sputnik 1 satellite and its rocket body so important? Well first, the discovery, evolution, and development of new technology as Sputnik 1’s launch brought us to the technological age that we now enjoy. But second, its rocket body was officially the first piece of space debris to be left in orbit after a launch. 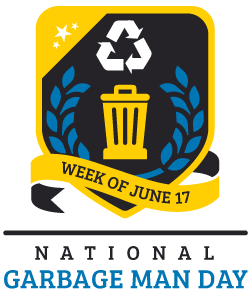 October 4th, 1957 was the day that we entered space and, sadly, the day we first started leaving our garbage there. Since that first dump, there have been 8,593 spacecrafts launched from the countries around the globe: Russia, United States, Europe, China, Japan, India, Israel, Brazil, South Korea…the list goes on. But when you understand that every single one of those 8,593 launches left some degree of space debris behind, you may start to see the problem. According to NASA, the term space debris actually encompasses both natural particles (meteoroids mostly in orbit around the sun) and artificial particles (man-made debris mostly in orbit around the Earth). NASA and the IADC (Inter-Agency Space Debris Coordination Committee) define space debris as any man-made object in orbit around the Earth that no longer serves a useful function. Nonfunctional satellites: Every year, hundreds of satellites are launched into space by cell phone, television, GPS receiver, and major communication companies. In addition to those eventually aging and failing satellites, there are even more that observe everything from weather and greenhouse gases in the atmosphere to those that look away from Earth to study the stars. Regardless of their purpose, all satellites eventually wear out over time. They are really no different than the machines we have on Earth. Abandoned launch vehicle stages: Modern space shuttles are actually a piggyback of several rockets stacked on top of one another. When space shuttles launch it usually takes more than one rocket to power them into space. The additional rockets are fired off in stages. The final stages, or upper stages, expel material from the spacecraft that can easily get trapped in the Earth’s orbit. Solid-fuel rockets: Some space shuttles use solid rocket fuel for propulsion since this type of fuel can remain in storage for long periods of time while also remaining reliable for short notice launches. Like the upper stages, these fuel containers detach and are left to float in Earth’s orbit. Tiny flecks of paint: Millions of tiny pieces of paint may exist in the Earth’s orbit. Things such as heat when leaving the atmosphere or impacts with other particles can chip the paint free from launched satellites and other spacecraft. If there is so much of it, why can’t we see space debris? When we look at breathtaking images of Earth, we don’t see the landfill (space-fill as we like to call it) that surrounds it because of size ratio. The Earth is 7,917.5 miles across and much of the space debris is simply traveling too fast and is just too small in comparison. How does space debris cause problems in space? Let’s take a quick look at space debris and its need for speed. Space debris travels at roughly 17,500 mph. That speed is hard to fathom, even with the keenest of imaginations. For the sake of making our point, let’s give it a shot. 17,500 mph is nearly seven times faster than a speeding bullet (a bullets travel at roughly 1,700 mph). At that speed, space debris can cause extensive damage to anything that it collides with. To make matters worse, space debris isn’t colliding with stationary objects. According to NASA, the average impact speed of a piece of orbital debris running into another moving object is 22,370 miles per hour (roughly 13x faster than a speeding bullet). NASA also points out that being hit by a piece of debris smaller than half an inch around, as it travels at about six miles per second, would be like being hit by a bowling ball traveling at 300 miles per hour. What does the threat look like? In addition to the many millions of pieces of debris that are so small they can’t be tracked there are roughly 500,000 pieces of space debris the size of a marble or larger (1 cm in diameter). Even more dangerous are the roughly 20,000 pieces of debris orbiting the Earth that are larger than a softball (8.89 to 9.652 cm). While an astronaut’s suit is engineered to keep them safe under extreme conditions, it is not able to protect them if they are hit by anything measuring larger than 1 cm in diameter. The only protection they have from objects that size comes from the Whipple shields on the International Space Station (ISS). A Whipple shield is a multi-layered shield designed to break up impacting object as they pass through multiple layers. To protect against bigger objects the shields have to be bigger. Bigger means heavier and heavier means difficult to launch. That’s one of the reasons that the shields on the ISS do not protect it from everything. When it can’t protect itself or its astronauts, the ISS has to get out of the way. Thanks to the film industry, the thought of moving anything in space seems relatively simple. In reality, a change in position for something as large as the ISS (roughly the size of a football field) actually takes days to complete. In fact, in 2014 the ISS had to avoid collisions with debris not once, not twice, but a painstaking three times. Note: Remember that the ISS is a temporary home to real life astronauts. These collisions could have had deadly repercussions. There are also times when there is no time to move. When this happens, the astronauts of the ISS make their way to emergency shelters in the station, wait out the impact, and hope for the best. In the event that a major satellite came into contact with space debris, severe damage or destruction would likely occur. The chances of this happening are not that far removed according to the Kessler Syndrome. How does space debris cause problems on Earth? The IADC Space Debris Mitigation Guidelines defines LEO as an “Orbit around Earth with an altitude of 2,000 kilometers (1,200 miles) or less, and an orbital period of between about 84 and 127 minutes.” In addition, the majority of space debris exists in LEO where it is colliding with itself to cause more space debris that is effectively continuing the same process. In other words, space debris is making more space debris. It’s also important to know that the most commonly used orbits for both manned and unmanned space vehicles are within the LEO. Yes… that includes our beloved cell phone, television, GPS receiver, and major communication company satellites. If all telecommunication satellites were wiped out, the world would rely on undersea cables and ground-based communication systems. The shift of usage away from the satellites would quickly stretch the capacity of these systems to their limit. Hundreds of millions of Internet connections would be lost while a similar number of cell phones would become useless. Remote areas could lose service altogether, leaving the residents previously dependent on satellites for television, Internet, and radio in complete darkness. Scary Fact: In 1998 one satellite failed and all of the pagers in the world stopped working. A lack of personal navigation would have a large impact but, if the Global Positioning System (GPS) were lost, there would actually be a lot more at stake. • Airlines use GPS to chart the most fuel-efficient and expeditious routes. • Aircraft controllers would have issues communicating with and routing airplanes. • Navigation driven cargo vessels, supply-chain management systems, and transportation hubs could be derailed. • The lack of effective global syncing provided by GPS would affect banking. The halted timing of transactions needing to be recorded would likely freeze credit card payments and bank accounts. Businesses could lose billions of dollars. In an interview with Gizmodo, 21st-century warfare expert Peter W. Singer from New America Foundation was quoted as saying, “He who controls the heavens will control what happens in the battles of Earth.” Singer continued to note that our active satellites are like the nervous system of the military. If that system were lost then our military capabilities would return to the “pre-digital age.” Say goodbye to drones, guided missiles, and ground unit communication. How is the global community currently dealing with space debris? The US Air Force has been on top of the space debris problem since the early 1980s. In fact, they have a specialized team dedicated to cataloging and documenting the issue. As of 2016, they had cataloged over 200,000 items that were about the size of a small ball and those roughly 500,000 items we mentioned that are the size of a regular marble. Lockheed Martin is working to complete a digital radar system that could wrap around the Earth like a fence, allowing the US Air Force to log even more debris using optical sensors and an intensified wavelength frequency. This honed tracking would allow smaller objects to be followed more accurately while allowing researchers to predict their future movement. This is a huge help when there is the need to get important things like astronauts, live satellites, and the ISS out of harm’s way. The European Space Agency (ESA) is testing the idea of taking the human component out of a spacewalk. Their proposed alternative is a remote-controlled robot named Justin. Justin would replace the astronaut as a physical presence outside of their manned vehicle without replacing their needed skill set. To make sure that the astronaut still maintains fully hands-on, Justin’s tactile movements would be felt through electronic sensors placed in a glove worn by the remote astronaut operator. The price tag for space debris clean up is staggering. Luckily, the nature of this problem has piqued the interest of a few private companies. It is probable that no one was thinking about the future debris repercussions caused by that October 4th, 1957 launch. Unfortunately, the world’s scientific community is not that lucky. We need them to once again push their limits of innovation and technical ability to the breaking point in an effort to clean up our space debris past before it diminishes our future. October brings the first artificial satellite and John Glenn’s return to space 36 years after he first orbited Earth. Here are three historic space dates for October. Launched into an elliptical low Earth orbit on October 4, 1957, Sputnik I became the first artificial satellite to be launched into space. The satelitte transmitted until its batteries died, 21 days after launch. Sputnik I reentered Earth’s atmosphere on January 4, 1958 and burned up on reentery. The Soviet Union’s successful launch of Sputnik I is credited for triggering the Space Race. It also set the stage for a slew of political, military, technological and scientific developments. The launch of Apollo 7 marked the first space flight mission since the tragic Apollo 1 fire that killed astronauts Virgil “Gus” Grissom, Ed White and Roger Chaffee in January 1967. After being grounded and investigated for 21 months, NASA returned to the space race. Apollo 7 was an Earth-orbit test of the command and service modules. Apollo 7 also brought the first live television broadcast from an American spacecraft. Walter M. Schirra commanded Apollo 7 and is the only astronaut to fly Mercury, Gemini and Apollo missions. At the age of 77, John Glenn returned to space aboard the Space Shuttle Discovery as a payload specialist. The mission lasted nine days and was part of a study on health problems associated with aging. By participating in the missions, John Glenn became the oldest person ever to fly in space. After his historic flight in 1962, John Glenn came to be viewed as a national hero. Because of his status, he was viewed at too valuable of an asset to risk losing. As a result, John Glenn was essential grounded until his triumphant return to space in 1998. Visit SpaceWasteSolutions.com to find out what what has been left in orbit since beginning of the Space Age. Some debris was launched into space over a period of decades, and the Earth is surrounded by it. Space debris is like space junk which can cause damage and multiply the debris. This junk needs to be removed, but the process of removal is not that easy. Human space activities will no longer be possible if the space environment is not clean of the debris. A lot of methods were proposed in order to de-orbit the debris or remove is. They are either contactless methods which use laser or contact methods which use tether net and other materials. What we know is that the contactless methods are safer. Another contactless method would be the usage of the ion beam shepherd which uses a plasma beam which gets ejected from the satellite aiming to impart the debris with a force so it would fall to a lower altitude and burning up when it enters the atmosphere of the Earth. Two propulsion systems will be needed in order to effectively and safely remove debris, and those will be mounted on the satellite. However, the satellite will need to be smaller and lighter as well. A new method needs only one propulsion system, and it was developed by an Australian and Japanese research group. The method was tested in a laboratory, and it seems like it is the best working so far and it does not involve such risks. The system the team of researchers is using includes a single plasma thruster which can be used for three tasks such as the debris removal, the acceleration of the satellite and for its deceleration as well. Hopefully, the method will be technically developed and end up on being used to the human space adventures will continue. From the announcement of a new Manned Spacecraft Center to first successful unmanned trip around the moon to the first privately-funded space flight. Here are four major space dates for September. NASA announced Houston would become the home to a new spaceflight center. The Manned Spacecraft Center would be the site where manned missions would be managed and supervised. The space center brought 751 NASA employees to Houston and hired an additional 689 new employees. Houston’s Mission Control Center officially opened in September 1963 and would oversee the upcoming Apollo Missions, including the first manned mission to the moon. On February 19, 1973, the Manned Spacecraft Center was renamed the Johnson Space Center in honor of the late President Lyndon B. Johnson. Shortly after 8 am, Space Shuttle Atlantis landed safely at Kennedy Space Center in Florida. Aboard was NASA Astronaut Shannon Lucid who was returning to Earth after 188-day days in space on the Russian Space Station Mir. Shannon Lucid set a new U.S. space endurance record and a world record for women. She is also the only American woman to serve aboard Mir. SpaceShipOne completed it’s first flight on May 20, 2003 and achieved supersonic flight on December 17, 2003, the one-hundredth anniversary of the Wright Brothers’ historic flight. Finally, on September 29, 2004, SpaceShipOne completed the first privately funded human spaceflight and became the first privately built ship to reach outer space. SpaceShipOne was an experimental air-launched rocket-powered aircraft with sub-orbital spaceflight capability. It was funded by Paul Allen, designed by Burt Rutan and manufactured by Scaled Composites. 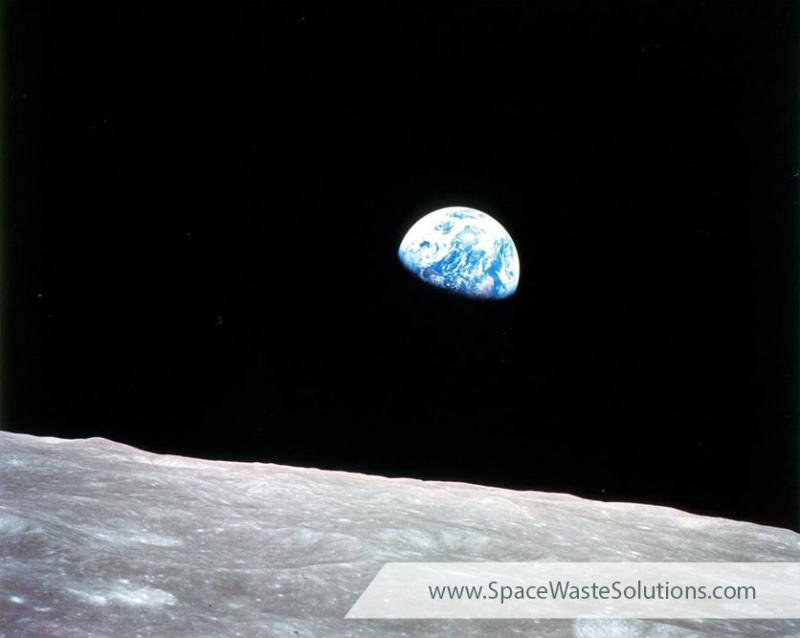 Check SpaceWasteSolutions.com to see what is being done about to address space waste these missions leave behind.